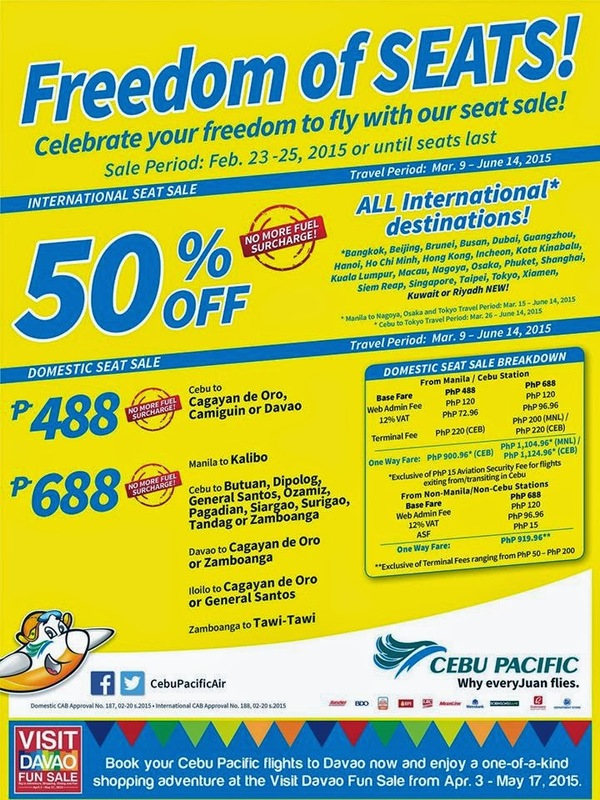 Cebu Pacific Promo Fare: Freedom of SEATS! Celebrate your freedom to fly with our #CEBseatSale! *Only for flights coming from Manila exclusive of Php 15 Aviation Security Fee for flights exiting from/transiting in Cebu. * Bangkok, Beijing, Brunei, Busan, Dubai, Guangzhou, Hanoi, Ho Chi Minh, Hong Kong, Incheon, Kota Kinabalu, ​Kuala Lumpur, Kuwait, Macau, Nagoya, Osaka, Phuket, Riyadh, Shanghai, Siem Reap, Singapore, Taipei, Tokyo or Xiamen. All-in Manila to Sydney fare is one way, inclusive of base fare, Web Admin Fee, Australia Airport Passenger charges Php 550 Terminal Fee and 7 kg hand-carry baggage allowance but exclusive of Php 1,620 Philippine Travel Tax to be paid at the airport upon departure from Manila and checked-in luggage. 50% OFF discount is applicable on INTERNATIONAL fares only inclusive of 7 kg hand-carry baggage allowance. The following fees shall apply after discount: PhP 120 Web Admin Fee, PhP 550 International Terminal Fee, PhP 1,620 International Travel Tax and check-in baggage. Country Specific Taxes ranging from Php 420 – Php 2,195 will be collected on top of fares departing from International destinations. Quoted DOMESTIC one way fares are inclusive of Base Fare, PhP 120 Web Admin Fee, 12% VAT, PhP 200 and PhP 220 Terminal Fees for flights transiting in/exiting from Manila and Cebu, respectively, and 7 kg hand-carry baggage allowance, but exclusive of PhP 15 Aviation Security Fee for flights coming from Cebu and check–in baggage. Terminal Fees ranging from PhP 50 - PhP 200 for flights originating from non-Manila/non-Cebu Stations must be paid at the airport. Promo fares have limited availability and are non-refundable but rebookable subject to the following rebooking fees: PhP 1,200 for Domestic destinations, PhP 2,000 for Short-haul International destinations and PhP 2,500 for Long-haul International destinations plus fare difference. Booking Admin Fee varies from PhP 120 – PhP 200 depending on purchase channel. For your convenience, flight changes, availing of prepaid baggage allowance for check-in baggage and web check-in service can be done up to 4 hours before scheduled flight. Manila to Puerto Princesa Palawan? Is there any? Hi, Thanks for inquiring. Promo fares are limited to selected destinations for now but don't worry more seat sales are coming, so stay tuned for those, just keep checking this page as we announce seat sales here. Pls. refer to the above post po. you may please do a mock booking po thru cebupacificair.com and mind the travel dates of the promo or visit any nearby ticketing office or agency or call these nos. for inquiry: Call (02) 70-20-888 in Manila, (032) 230-88-88 in Cebu. Thank you. Hi, Thanks for inquiring. Pls. refer to the above post po. There is but we cannot give you exact amount, as fare rates will depend on the date and time of your flight or you may please do a mock booking po thru cebupacificair.com and mind the travel dates of the promo or visit any nearby ticketing office or agency or call these nos. for inquiry: Call (02) 70-20-888 in Manila, (032) 230-88-88 in Cebu. Thank you. is there any flight from Davao straight to Thailand? How much po total ng brunei to manila?april 26 or 30? May available pa po ba this date? Pls email me at enermallari@ymail.com, thanks and godbless cebu pacific more power! How much po manila to cebu? Kailangan pa po ba ang passport? Hi, Thanks for inquiring. Passport not needed for domestic flights. You need it only for international flights. But you can use it as your ID when checking in. you may please do a mock booking po thru cebupacificair.com and mind the travel dates of the promo or visit any nearby ticketing office or agency or call these nos. for inquiry: Call (02) 70-20-888 in Manila, (032) 230-88-88 in Cebu. Thank you. pwidi po bah dito magpabook ng Cebu Pacific Promo Fare? thanks po..
Hi, Thanks for inquiring. We don't do bookings here. you may please book po thru cebupacificair.com and mind the travel dates of the promo or visit any nearby ticketing office or agency or call these nos. for inquiry: Call (02) 70-20-888 in Manila, (032) 230-88-88 in Cebu. Thank you. Can i book my flight to macau. Here and now? Promo still available? Hi, Thanks for inquiring. We don't do bookings here.Pls. refer to the above post po. you may please do a mock booking po thru cebupacificair.com and mind the travel dates of the promo or visit any nearby ticketing office or agency or call these nos. for inquiry: Call (02) 70-20-888 in Manila, (032) 230-88-88 in Cebu. Thank you. Hi, Thanks for inquiring. We don't do bookings here. Ticketing Agencies will definitely charge you for their commission fee. So that's expected to be higher. You can always book your tickets online direct with cebupacificair.com and mind the travel dates of the promo. for inquiry: Call (02) 70-20-888 in Manila, (032) 230-88-88 in Cebu. Thank you. manila to kalibo promo avail pa? for april sana flight? hi.good pm may ticketing outlet po ba sa cubao near ali mall? Hi po.. How much po boracay april 3 to 5.. Pa book po ako. Cebu Pacific Promo for Chinese New Year 2015!